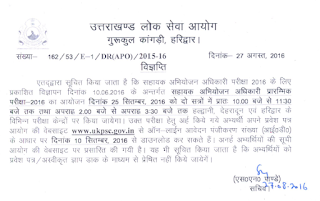 Uttarakhand Public Service Commission (UKPSC) had organized Assistant Prosecution Officer (APO) (Hindi: Sahayak Abhiyajan Adhikari) Pre Examination on 25 September 2016. The advertisement for these posts was released on 10 June 2016. Now the application process is over and preliminary written examination had been held on the said date. UKPSC will be preparing the results now. Those who want to know about UKPSC APO Exam Result can stay in touch with this page. Candidates should download UKPSC APO admit cards from here via the official website ukpsc.gov.in. 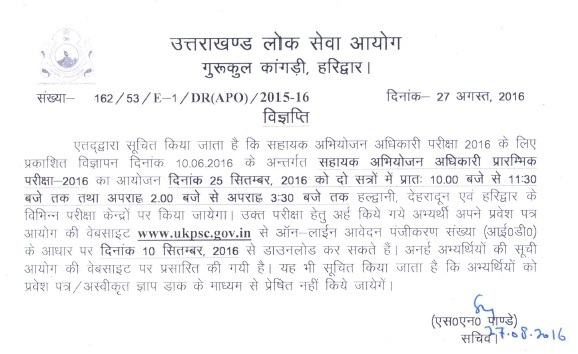 Uttarakhand Public Service Commission is going to conduct written exam on 25.09.2016 from 10:00 am to 11:30 am and 02:00 pm to 03:30 pm for Assistant Prosecution Officer posts. For that, you can download your admit card from 10 September 2016. 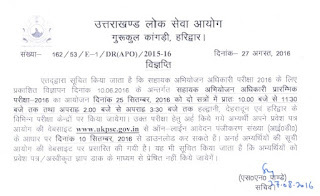 Now UKPSC APO Exam Admit card are available online at ukpsc.gov.in from 10.09.2016. To get them, just visit the below link. The written test is to be organized at Haridwar, Dehradun, Haldwani exam centres. The list of ineligible candidates had been released now and you can check your name / roll no. in that. It is available at below link. The candidates can download their admit card from UKPSC website via the link here. To download the admit card for UKPSC APO exam, candidates need to visit below link. Then candidates need to enter their registration details and click submit. 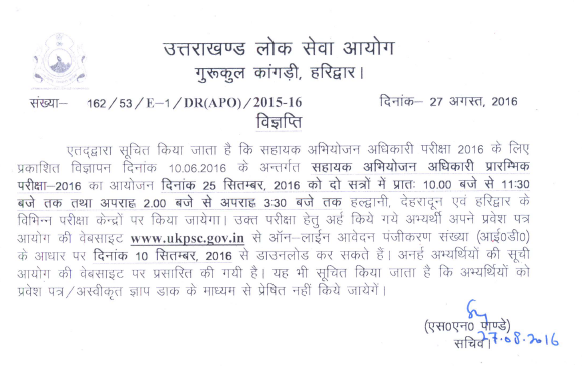 Their UKPSC APO Admit card 2016 will be shown and its print should be taken after that.